I picked up two sheets of this paper, "Thai Garden Smooth"-- at New York Central Art Supply the last time I was in NYC. I have a print idea I have been kicking around for a few years that will be a little bigger than I usually work and that would tolerate a surface that isn't perfectly smooth and where a little surface irregularity might be made part of the print. This paper seemed to be what I was looking for: just off-white, fairly heavy, and had a nice feel in the hand. It's made of 100% Thai kozo and is unsized. 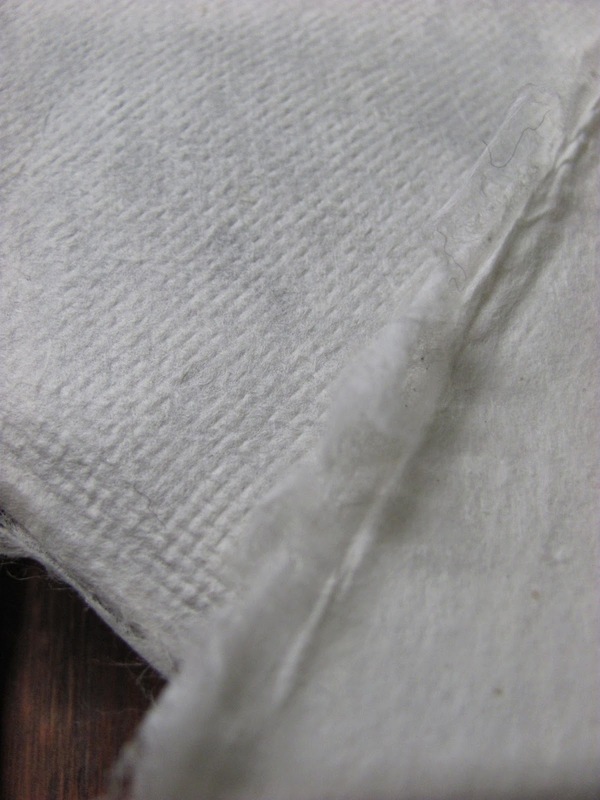 Amazingly, it was also only $4.00 a sheet instead of $30-40 for Japanese Kozo papers of a similar weight. 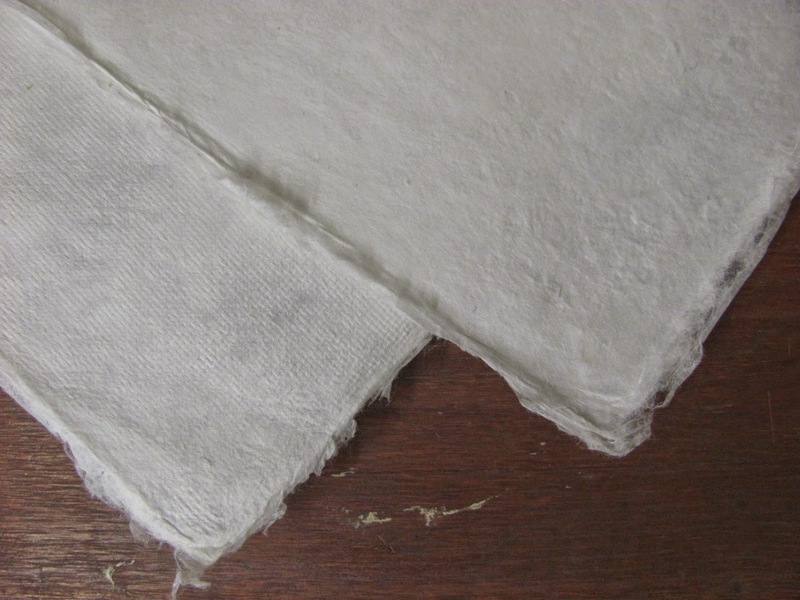 The bad news is that besides being unsized and called Thai Garden SMOOTH (emphasis mine), the back of the paper is quite textured from what looks like was a pebbly cloth or screen used to form or dry the paper and it is unsized so would need to be sized for my purposes (moku hanga). Well, I'm ok with sizing, but I'm not sure how the back of the paper will react to size--if each of those little bumps holds or allows size to pool I'll get a pronounced pebbly look to the front too and there's a chance that that surface texture will print no matter what.....(I probably should have just sized the front and not both sides, but I didn't think of that until AFTER I had sized both sides.). I think it's funny that I'm working on a print now that was prompted by two sheets of paper that have a good chance at being totally ill-suited to the purpose. I'm not sure if this is experimentation or just plain auto-sabotage. But as the paper was just $4/sheet I thought that it was worth a try. But I have blocks to carve before I can even think about printing. While I may not have made the cover, my first etagami for the Italian/Japanese Etagami exchange made it into the May 2014 edition of Etagami monthly. That's my red radicchio on the left. Pg. 4. This is the cover of the May Etagami news magazine. I don't think it's due to the incredible beauty or calligraphy of my work, but instead due to the fact as this is the first Etagami exchange organized by that association outside of Japan, and this is Florence, it made interesting news for their readers. There was a multi-page article about Florence, and the exchange. I think there are about 30 Italians participating. 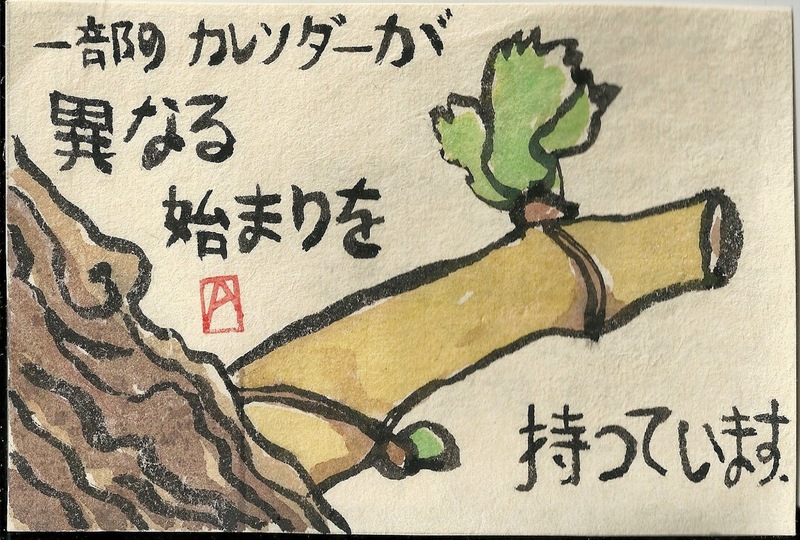 The etagami that I sent to Japan this month was taken from a recent photograph of a grape vine budding out. 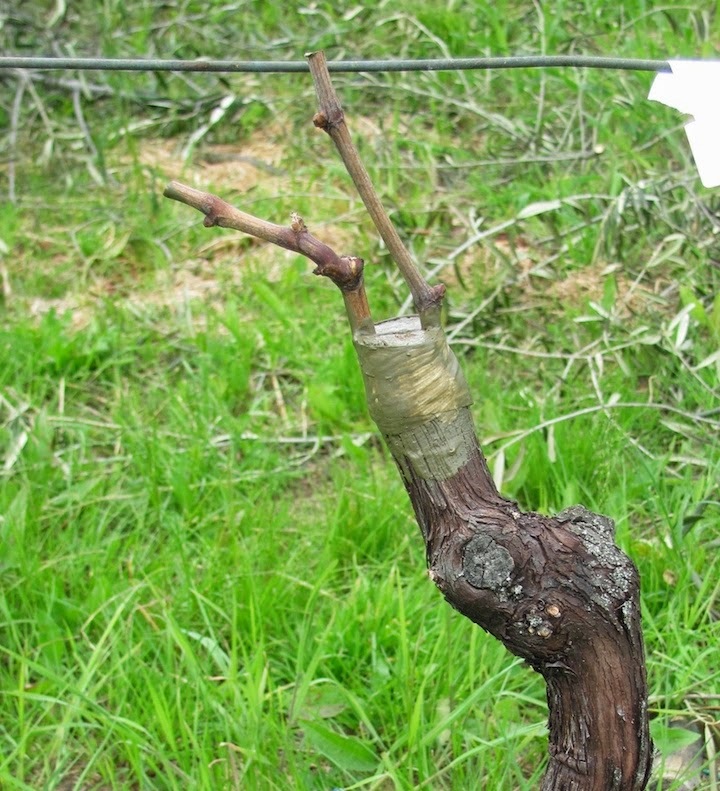 In the wine-making world, this represents the beginning of the growing cycle and the bud will soon be a long vine studded with grapes. 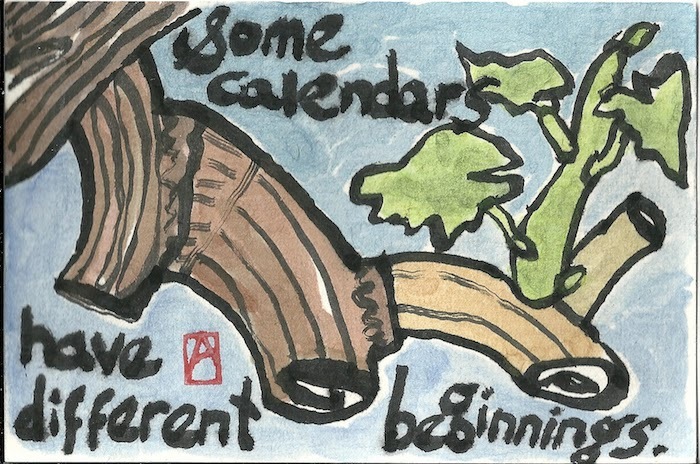 The accompanying text reads, "Some calendars have different beginnings...". Some Calendars have different beginnings. 3"x5" sumi and watercolor on Japanese kozo paper. I also did another, this time in English; and sent it off as a postcard to a gardener and friend in Santa Cruz. 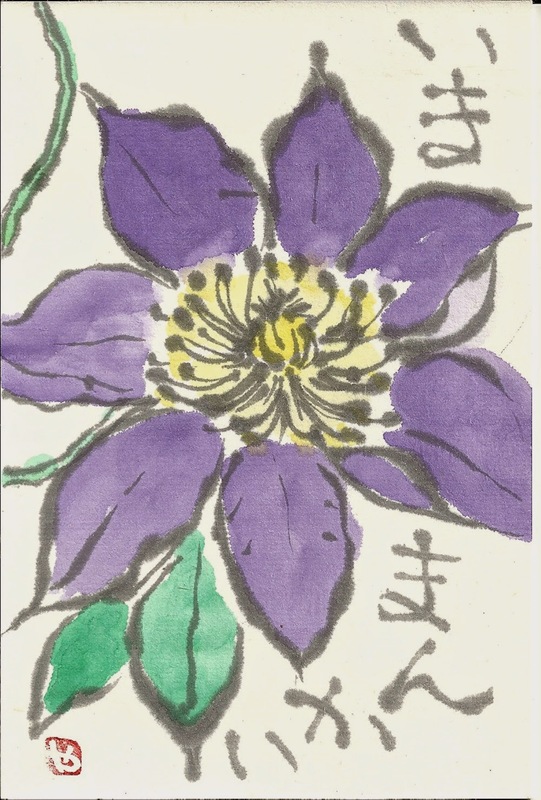 And today I stopped by the LAILAC Japanese cultural center to pick up my just-arrived card from from my etagami/penpal in Japan; It portrays what I think must be a blue clematis--called Tessen in Japanese. About 15 years ago, when we had a new water line brought to the farmhouse. The backhoe operators, either out of carelessness or just unawares, managed to take out an entire row of old grape vines. After getting pretty mad, and trying to yell in Italian and waving my arms a bit; they did agree at least to partially pay for replacing the vines. So that Spring I brought home 40 grafted table-grape plants and planted them in the soft earth where the new lines had been sunk underground. Unfortunately, 15 ended up being mislabeled and, instead of a the Italian variety, Maraviglia--a very large, pink, seedless grape---when they started producing grapes 2 years later produced dark, black wine grapes that never seem to really ripen and that even the birds ignore. But they're vigorous, grow well and make grapes every year. So this year. I decided to try my hand at grafting them over to a new variety. In big vineyards this wouldn't be economically feasible but as my labor comes cheap and if it works we'll get a crop as early as next year. 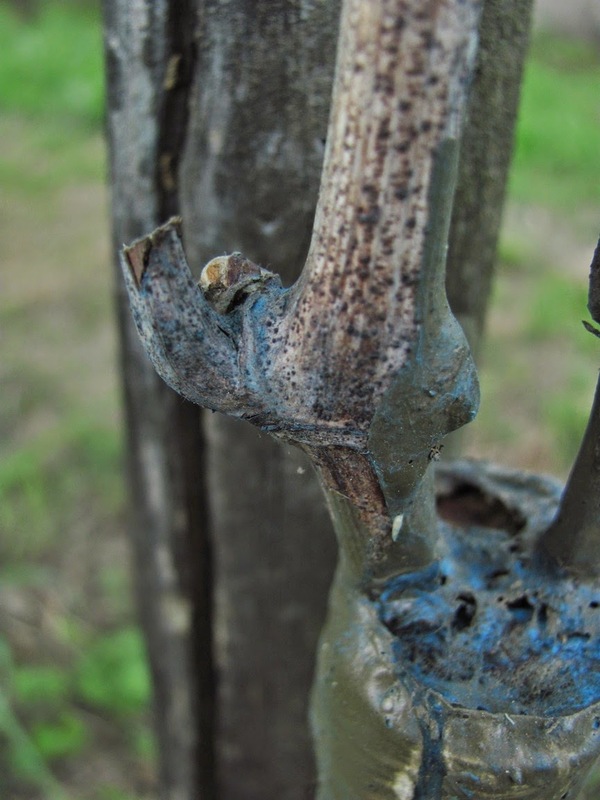 Top-working is a euphemism for the rather drastic decapitation of the top part of the vine to be replaced with new graft wood. It is cut off with a saw about 15" off the ground and an axe is forced vertically into the top of the stump creating a split. 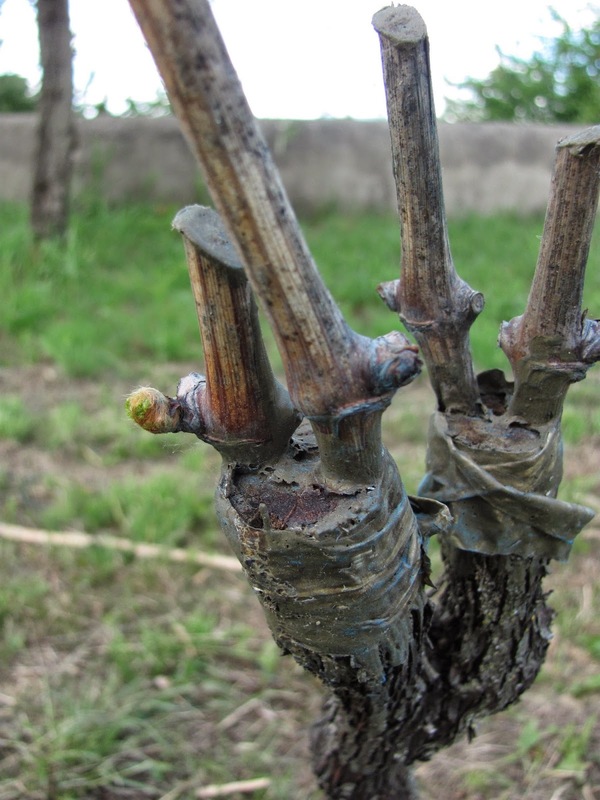 I then take shoots from the previous year's growth from a different kind of grape and using the grafting knife cut it into a triangular, wedge shape. This then gets gently tapped it into the cleft I've made with the axe. Each stump gets two scions of graft wood. The tricky part is that the living part of the wood; the cambium layer--is under the bark and is a thin, green layer of living cells. The cambium layer of the graft has to be in contact with the cambium layer of the trunk--but they're different diameters and colors and if they aren't placed just right and in contact they won't fuse. The whole graft is then wrapped tightly with tape and then covered with a grafting/sealing compound to seal them and keep them from drying out. I was encouraged by last year's grafting attempts. My pear and apple grafts all took and are growing well and the one failure--a plum tree I grafted from a variety I found growing in an abandoned village in Liguria (don't know what the plums will look like....) didn't grow last year but this year sent out two healthy sprouts from the graft and I took that as a sign to forge ahead. 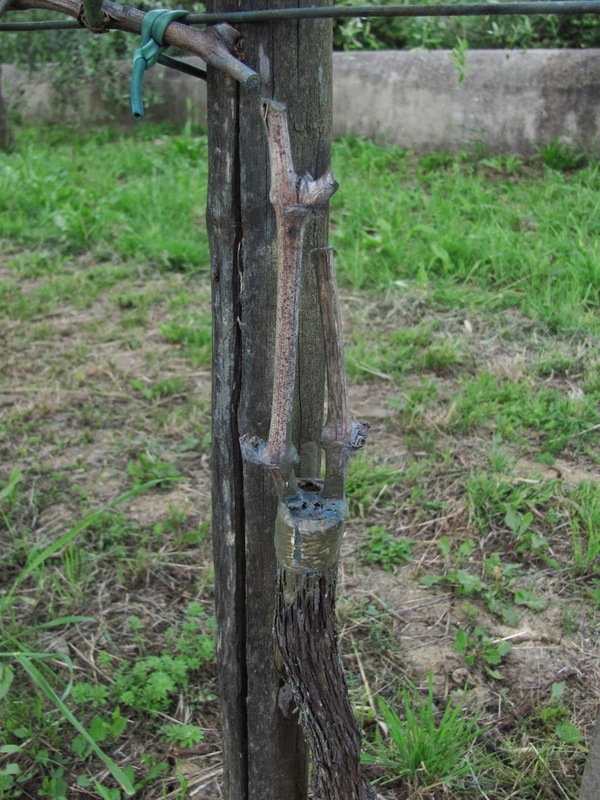 So, 6 weeks ago, armed with a saw, a sharp grafting knife, a bag full of grape scion wood I had cut in late winter and stored in the refrigerator, a paintbrush and some grafting tape and glue I set out to try changing these vines to a grape we would eat. I chose 8 vines and grafted 3 Muscat di Hamburg; 2 Sultanina Bianca (white seedless/sultana), 2 Uva Regina and 1 Pizzutello nero. While the cleft graft is supposed to be the easiest and have the highest success rate. Those qualities must be true for more competent farmers than I am. I can't say I'm overwhelmed by how successful I've been. I grafted four scions but only the Left bud seems viable. Well, this one seems happy. I have 3 definite takes; They're budding out and are clearly going to be ok. I have another 2-3 that seem to have, maybe, some swelling and filling of one of the buds....but aren't actually growing. And I have 2-3 that don't really show signs of anything and are probably dead. I'm still optimistic though. 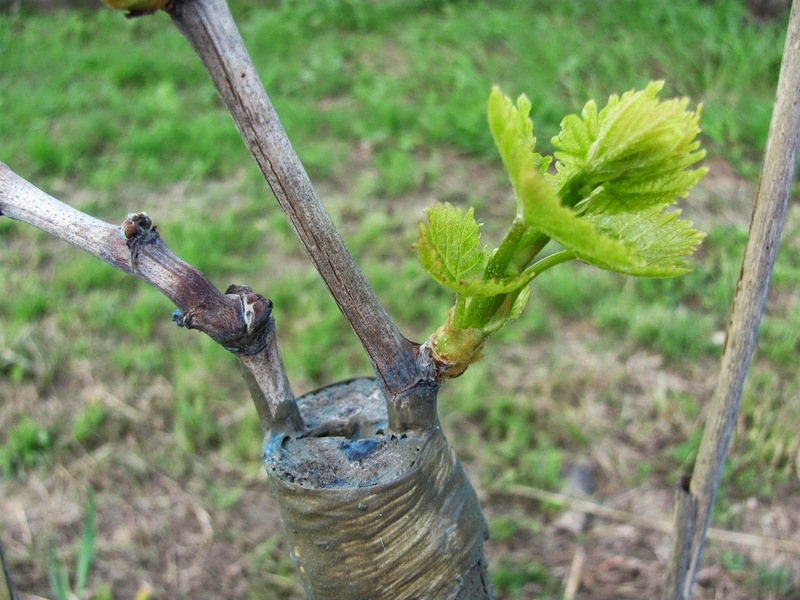 It's still early Spring and In the best scenario, a few more will bud out and survive to make fruit next year. This looks like we have nothing. But MAYBE this bud is trying hard to sprout? Worst case scenario is that they won't take. But since we weren't eating those grapes anyway, that's not much of a loss. And I can always just dig those out and plant new vines next Fall. 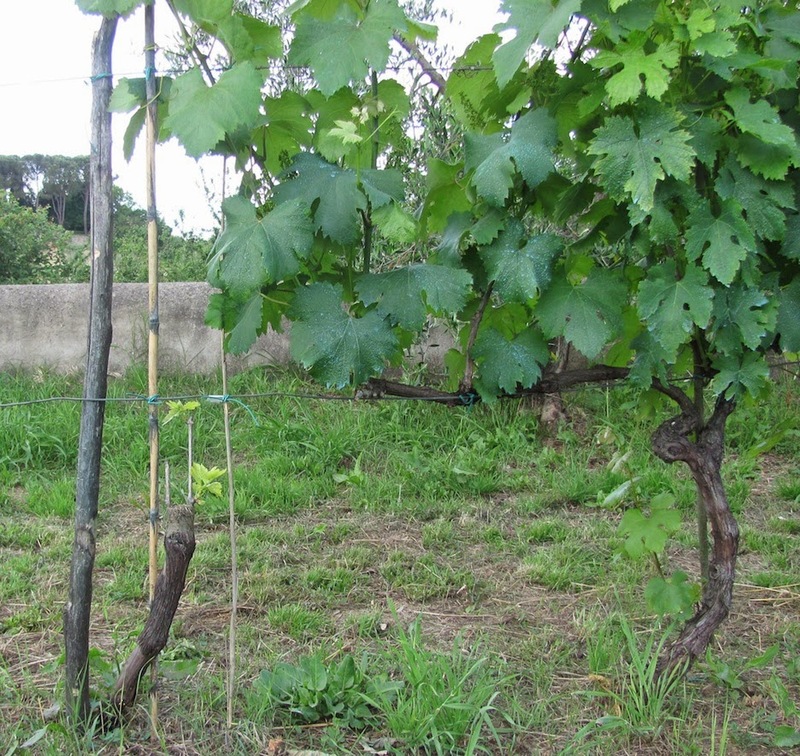 Here's a comparison of a grafted vine on the left (I used dormant buds so the plants are behind in their growth) and one that wasn't grafted and is growing normally on the right. 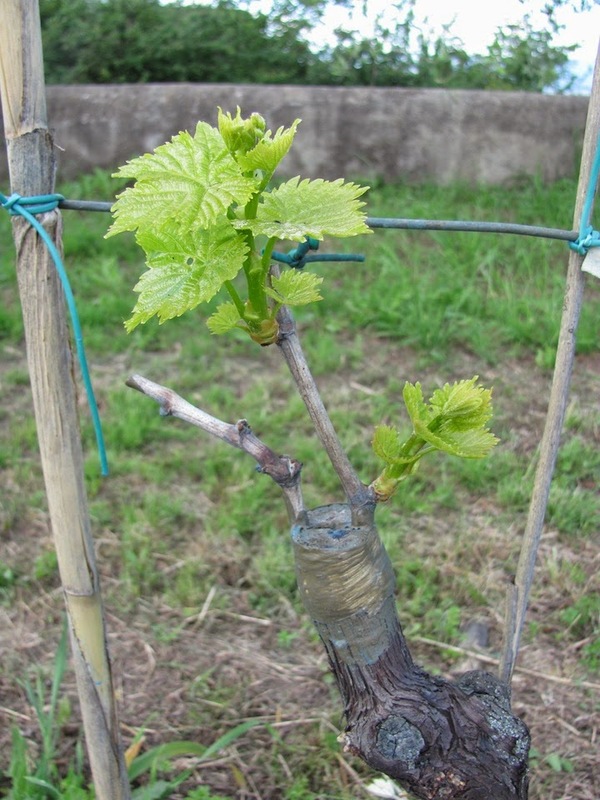 I need only one shoot from each plant to be able to develop them into productive vines. I'll post more photos as time goes on and try to chronicle my success/or failure with this grafting attempt.